Urban Sketchers Seattle: Shell oil rig "Polar Pioneer"
Shell oil rig "Polar Pioneer"
With the Shell oil rig Polar Pioneer in the news, I headed to Harbor Island to see it for myself. I found a quiet spot just north of the old flour mill, facing west with a great view of the rig. I parked in the lot behind the Arco station, affording a close-up view. I got there early on a Sunday morning with no one else around. After an hour or two, sightseers started coming and going, getting out of their cars to take pictures of the massive rig. There was a guard on duty adjacent to the parking lot, and a Foss tug churning the waters of the Duwamish. As I sat in my car drawing and painting, I thought of Maynard Dixon and Dorothea Lange. He was a painter of the desert southwest, and she a photographer documenting the social issues of her time. He was happy with the poetry of paint; she believed art should serve for the greater good of society. 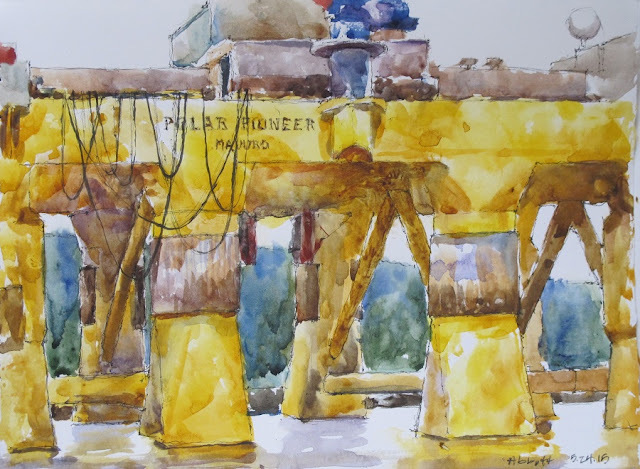 Labels: Harbor Island, Michele Abbott, Shell oil rig "Polar Pioneer"
Such a beautiful sketch of this controversial oil rig.